The work plan has been divided into 4 Sub-Projects (SP) and 11 work packages (WPs). WP1 is responsible for the efficient and productive control of SensorART project. The parts that compose this workpackage are deal with administrative and technical management. Administrative management will promise the internal (inside consortium) and external (with EU) communication, the timely control of progress work, the quality of project deliverables and the efficient financial resource handling. Technical management is responsible for the deliverance of high quality and innovative results inside project’s time constraints and specified budget. To analyze the project impact dimension and building the approach on sustainable development, in parallel with the expected results. To promote the awareness and, hence, the exploitation of the project’s results will be identified and pursued. To identify potential stakeholders and promotion activities targeting communication of knowledge and potential project applications will be undertaken. Collect and analyse policies that represent the legal framework within SensorART will work. Development of BioMEMs device that will base on a polymeric substrate and will integrate microsensors arrays and microfluidic, structure, which will be made on polydimethylsiloxane (PDMS). The immunosensor will be based on metallic micro/nanoelectrodes. The BioMEMs should allow the multiplexed detection and quantification of proteins by specific antibodies immobilized on gold micro/nanoelectrodes. Develop the immobilisation procedures of antibodies onto functionalised gold micro/nanoelectrodes using Dip-pen nanolithography and to optimise the measurements criteria for impedance spectroscopy in order to achieve immunodetection of proteins in buffer solutions with a detection limit comparable with ELISA tests. The experimental conditions for working of an individual immunosensor will also be defined. Finally, electrochemical characterisation of the BioMEMs will be performed using blood containing soluble proteins. WP5 integrates sensors and bio-sensors to meet biocompatibility standards of the VAD, develops a wireless power unit based on inductive coupling compelling with safety norms for variable magnetic fields exposure, releases a prototype for joint integration with the VAD controller and/or sensor nodes and reassures the interoperability and the expandability of the sensorized VAD. 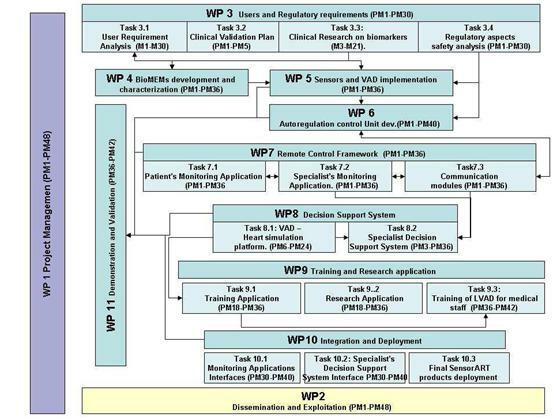 The goal of WP6 is to develop a VAD independent autoregulation unit. The auto-regulation control algorithm will be implemented in an external and wearable hardware unit, which will be wirelessly linked to the implanted sensors and to the VAD actuators. This unit will allow to autoadjust the blood flow provided by the VAD to the patient’s heart according to signals coming from physical and physiological sensors. Moreover, this unit will monitor the energy consumption, as well as the VAD functionality, thus generating the appropriate crucial and vital alert messages. The autoregulation unit will be designed to allow interoperability among different VAD systems. WP7 provides the Patient’s Monitoring Application, the Specialist’s Monitoring Application and tests and evaluates the capability of the developed applications to be used by the clinical workflow. WP8 provides the VAD – Heart simulation platform and the Specialist’s Decision Support System. WP9 provides the Training application based on patient-treatment scenarios, the Research application based on a data collection module and a research database and a Training Tool for personnel in charge for LVAD. WP10 deals with?the implementation of efficient multi-parametric and adjustable monitoring interfaces, the development of a multi-variant user interface of the specialists’ decision support system which will assist the specialist deciding the best remote treatment procedure and with the tests, integration and delivery of the final SensorART products by deploying the research?products with the intelligent decision support algorithms. Check possible biocompatibility issues (mechanical wear, histopathological changes).